Recently on Instagram, I shared my "food rules." 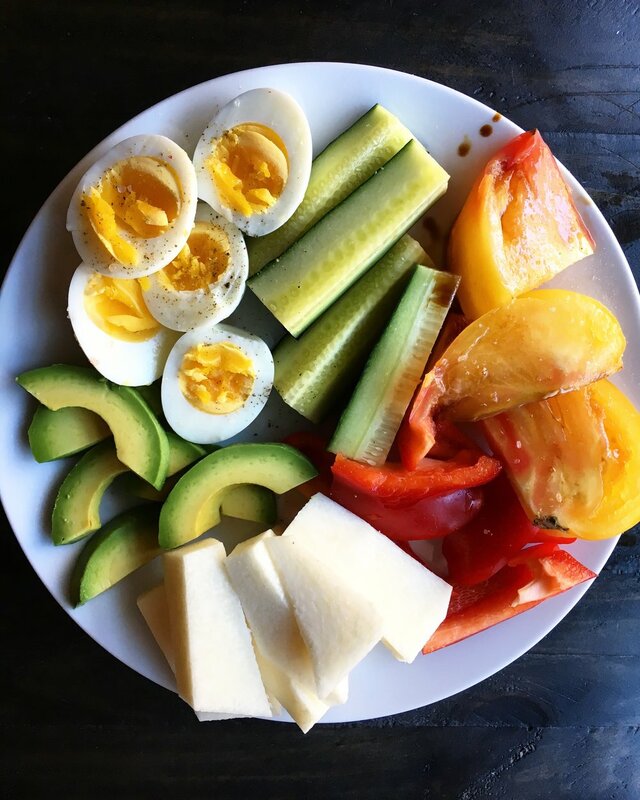 I had just gotten home from the farmer's market after teaching yoga in the park on a beautiful Sunday morning, and felt inspired by the all the local and lovely fresh produce on my plate to share my personal thoughts on "healthy eating." There's an abundance of diets and rules about what you should and shouldn't eat, and it was important to me to put something out into the world that would escape some of that diet-culture dogma that gets spread around on a daily basis. Eat things that make you happy. Really, legitimately happy. Don’t cram food you truly hate down your throat because it’s “good for you” and don’t eat something that’s not very nutritious just because it’s there and you’re bored. Listen to your body. It knows what you need if you learn how to observe the signs it gives you. This takes time, patience, and practice. Don’t listen to anyone who claims to have “the perfect diet.” We are all physically different and exist in drastically different contexts. What you need will change, even from day-to-day. Don’t become too attached to one label or one routine. If you take care of your body with foods you know make YOU feel good most of the time, eating stuff that doesn’t make you feel so good when you legitimately want it won’t be a big deal. Be involved in your food as much as possible. Engage with the people who grow it. View cooking as self care and an art. Share it with those you love. Screw the idea of “cheat days.” You’re a grown up who chooses what they eat. You’re not “cheating” on anything as long as you’re making conscious, deliberate choices. Food has different values. Nutritionally, emotionally, culturally, and even spiritually. Balance these out and know that they’ll take different priorities at different times in your life. Do your best (that doesn't mean strive for perfection). Make your own rules (and know when to break them). The responses I got were overwhelmingly positive. People are tired of having everyone trying to cram the one "right" way of eating down their throat: one person is telling you that raw veganism will solve all your problems, the other claims Paleo is the only way to go, yet another says "everything in moderation" and dismisses observing your body's personal needs in the process. Partially as a a result, it seems to me, people are also tired of feeling guilty about their own personal food decisions. My friend Molly said it in the comments beautifully: "Screw guilty pleasures. I refuse to feel guilty about taking pleasure in what I eat!" Another common comment, however, was, "let's get this on a poster!" Well, my friends, ask and you shall receive. Below you'll find a link to download a poster with all my food rules that you can hang up wherever you'd like. Let's break out of the diet-culture mindset we've been fed for so long, and let's embrace the beauty in living our lives with gratitude, empathy, and flexibility (on and off the plate).